This blog explores the understanding of ‘Under 5 Mortality’ (U5M) and risk factors present in Bihar. 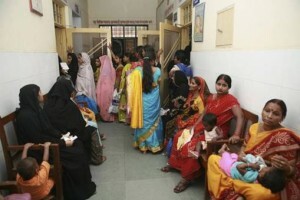 In-depth interviews were conducted with three pediatricians in Patna; two of them are retired government doctors currently practicing in their private clinics running out of their residence, and the other is a medical professor at a government medical institute in Patna who also runs a private clinic. All three pediatricians were interviewed in their private premises. An expert guideline was prepared for these interviews, it was an open ended questionnaire aimed to capture perceptions of vulnerability and understand risk factors that perpetuate vulnerability. It further explored the challenges existing in Bihar in terms of providing adequate health services to beneficiaries. Bihar is one of the most vulnerable states in India for mothers and children. Children in Bihar are suffering from treatable diseases. Cultural and socio-economic barrier are much more evident in Bihar as compared to other states. Poor sanitation practices, impure drinking water and extreme weather conditions contribute to many infectious water borne diseases. Children mostly suffer from infectious diseases that affect the lungs (pneumonia), Brain (meningitis) and cause diarrhea. The lack of basic sanitation facilities and poor hygienic practices could be the causes of these diseases. Availability of proper drinking water and appropriate nutrition within a poor family is a challenge. “ Hygienic practices are lacking in Bihar, uneducated families do not understand the importance of hygiene and proper sanitation. Open defecation is a common sight in villages and even in slums of Patna. Families that do have toilet do not use them on regular basis. There is no proper mechanism for discarding the leach pit toilets, open drains which run inside the houses are very harmful, they are water stagnation points and result in mosquito breeding”. Poor child care practices and lack of education among mothers plays a crucial role in making a child vulnerable. “Mothers in poor families are uneducated, they all practice breast feeding but not exclusively. This results in exposure to infections. Mothers who work as daily wage workers, and have more than two children prefer feeding packaged or cow milk over breastfeeding. Elder siblings who themselves have not reached teenage are compelled to look after the youngest child of the family. Imagine the type of care a child receives, left to play in unhygienic conditions”. Improper complementary feeding and poor nutritional practices are prevalent among families in Bihar. Dr. Nigam talked about the poor nutritional practices followed among families and how it impacts the health of a child. Despite vaccination schedule recommended by the government which is available free of cost at government hospitals, acceptance of vaccination is poor amongst the community. “When it comes to vaccination, Muslim families are not willing to bring their children, they have been misguided by their religious leaders that vaccinations are a mode of controlling fertility status of Muslim population” said Dr. Nigam. Another quote from Dr. Kumar on religious barrier influencing health seeking behavior,“Yes, there are religious and cultural beliefs but enhanced parental education will help us overcome these lacunae”. He further added that “More than cultural beliefs it is the pain during vaccination or a minor illness after it, even among the educated, which delays or prevents them from coming back for the next dose”. There is a large presence of unqualified medical practitioners in rural parts of Bihar, who are unfamiliar with relatively simple life-saving medications, and prescribe antibiotics and other potentially harmful drugs. Rural public health facilities across the state are having a difficult time attracting trained medical professionals. One of the retired government doctors spoke about ‘jungle raj’ i.e. times of poor politics, jeopardized legal system and no safety & security in the state. He said “During our early practicing days doctors were threatened to pay ransom to political parties, and if failed to do so family members were kidnapped and tortured”. Such violent situations have resulted in higher migration of qualified professionals from Bihar to other parts of the country and world. In addition to the shortage of doctors, the system is plagued by poor involvement and participation of those who are employed. There have been several instances of pregnant women being treated by nurses and ward boys, who have very little or no knowledge of handling deliveries. “Rural health facilities are poorly equipped, with no regular supplies and with high patient load . To work in such difficult conditions one needs a lot of patience and motivation”said Dr. Nigam, “Until and unless the government does not spend adequately in rural health infrastructure and manpower, things will not improve.” “Asking well-qualified doctors to work in such a system not only doesn’t cause any significant improvement in people’s health, but also wastes doctors’ education and skills”. Said Dr. Aggarwal. The Central and State governments make little investments in rural health systems and there are regular stock-outs of medicines, to add to already inadequate infrastructure. Our interaction with pediatricians raises certain imperative questions which we need to address through our primary research. It is important to gain understanding of how risk factors manifest in Bihar and to explore areas of opportunities for saving children from vulnerability. How social and cultural factors are contributing towards vulnerability? What can be done to address the social evils existing in society? Where and what kind of interventions need to be designed and implemented? It is also necessary to understand the challenges faced by qualified providers and in what capacity they can be resolved? Nida yamin is a public health professional working on public health issues like reproductive health, family planning , child protection, sanitation, tuberculosis . Currently, she is working on under 5 mortality in Bihar. This entry was posted in Design!publiC, Health Public and tagged challenges in Bihar, risk factors, Rural health, vulnerability. Bookmark the permalink.